The Hong Kong Economic and Trade Office in New York City was tasked in 1990 with creating an event that would highlight the growing relationship between Hong Kong and the United States. That summer, the first Hong Kong Dragon Boat Festival took place on the Hudson River off Battery Park City. “It was supposed to be a one-year promotion, but it got so many positive reactions we decided to make it an annual event,” says Henry Wan, president of Wan Development Group and co-founder and chairman of the Hong Kong Dragon Boat Festival. The event debuted with 10 teams competing in the traditional Chinese boat race. 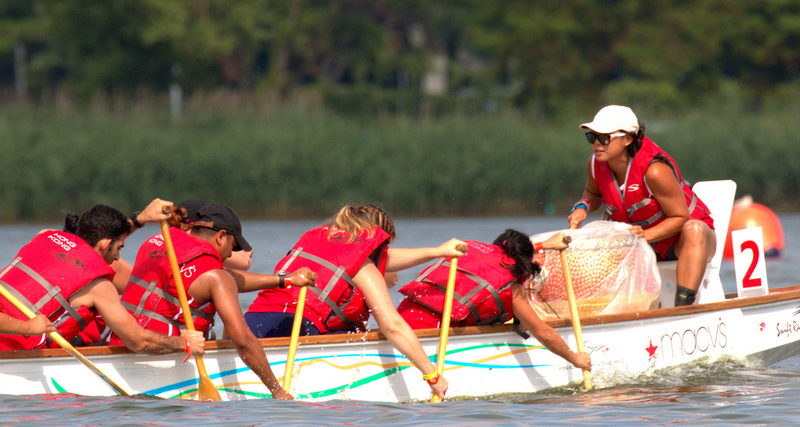 Today, it has grown into one of the largest dragon boat festivals in the US with approximately 200 teams and 2,500 competitors participating in the 28th iteration from August 11-12 at Flushing Meadows Corona Park in Queens, NY. The origins of dragon boat racing are based on the legend of Chinese poet Qu Yuan, who lived from circa 340-278 BC. Qu was a court minister who advocated reforms for his home state of Chu; however, the corrupt King of Chu disliked Qu and banished him. Wandering the countryside writing poetry expressing his concerns for his homeland and its peoples, Qu drowned himself out of despair in the Miluo River. Local fishermen tried to save him but failed in their attempts. Held on the anniversary of Qu’s death – the fifth day of the fifth lunar month – the Dragon Boat Festival commemorates his legacy. Four days before the event, the boats are taken from their resting place and the dragon heads and tails are attached. They are ritually blessed by a monk and later brought to life by having their eyes dotted with red paint. Each boat has a crew of 22: 20 paddlers (10 on each side), one drummer at the front of the boat facing the rowers and one steerer at the rear to direct the vessel. The Hong Kong Dragon Boat Festival in NYC boasts teams from around the country and even the world; Wan says teams from Italy, Canada and even China have previously competed. As the event expanded, the goal changed. While the primary focus was to highlight Hong Kong-US relations, the festival continued to showcase Chinese tradition and culture – particularly in regards to the dragon boat race – and grew into a multicultural event highlighting various cultures from around the world. Although the two-day festival features food, music, dance, performances, and arts and crafts, the highlight is still the dragon boat races. The World Eskimo-Indian Olympics (WEIO) are held annually in Fairbanks, Alaska. The four-day event celebrates and promotes the culture of native peoples. Launched in 2016 in Miami, grown is the brainchild of Shannon Allen, singer, actress and wife of former National Basketball Association (NBA) star Ray Allen. The restaurants provide 100-percent organic food and drink at the convenience of a fast-food chain.